BACKTIME: Yes Ed and Steve Sabol, You Built That! As a kid, everything was sports - as opposed to now which is just mostly sports. I played tennis and ran track, but on TV I devoured baseball and football. Basbeall was (and is) 162 games a year, but back then not every game was on TV and radio play-by-play came with you on the bike, in the backyard, after bedtime. The NFL wasn't as present or as saturated in our lives as it is today. There were three windows: CBS and NBC would have either the 1 PM or 4 PM game (which were almost always the Giants and Jets), and there was Monday Night Football. We didn't get doubleheaders in the New York area, and there was no NFL Primetime yet. What filled the gap, was the can't-miss Inside The NFL on HBO with Len Dawson and Nick Buoniconti, who hosted the show from 1980-2001. On Wednesday and Thursdays, they had extended highlights from all the games. And it wasn't just a video mash-up. It was the elegantly produced NFL Films coverage, narrated by John Facenda and later Harry Kalas, with that incredible music. The Sam Spence-composed themes were immortalized along with the great Facenda's voice on The Power and the Glory. If I'm ever down in the dumps, I can flip to my iTunes and remember that The Autumn Wind Is A Raider. Ed Sabol started NFL Films in 1962 in Mount Laurel, NJ, and then got the league contract to shoot every NFL game in 1964, employing multiple film cameras at each venue. In an era when broadcast networks were still recycling videotape, NFL Films became the archive source for the entire modern era of NFL history. 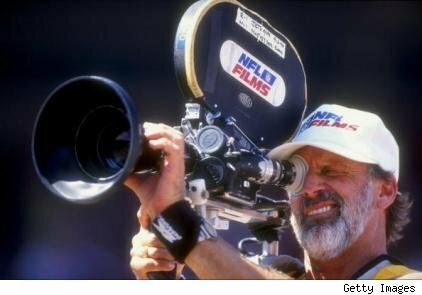 The NFL Films narratives of every Super Bowl contain the iconic images that we remember to this day. While Ed Sabol founded the company, his son Steve put it into our culture to stay. He would dig through the archives to create specials, compile the teams' seasonal yearbooks, and write, produce (and host) a number of other projects. Steve Sabol, the writer of "The Autumn Wind," died yesterday cruelly just before summer concluded. I'm sure the NFL will honor his memory in a style that befits a storyteller for a generation.